If you’re studying biology, chemistry, art, a pictographic language or any visual subject, you may have to memorize not only words and definitions but also pictures, diagrams, and symbols. Depending on how good you are at drawing, you may be able to use index cards here, but this is time consuming and can be frustrating. We live in a modern age though, and there is a better way. Everyone has different backgrounds. I was amazed to discover that many university students I’ve run into haven’t learned how to do this stuff, but isn’t always taught as early as it should be, possibly never in some schools, and besides I’m not sure where exactly I picked it up. So I’ll start with a very basic introduction to PowerPoint for those who haven’t used it before. Then I’ll explain how you can use the program to study complex pictures in the second section. This might be too complicated for some, too simple for others, but I’m hoping this helps somebody. Disclaimers: I should note that I use the 2007  version of Microsoft PowerPoint, but I learned these techniques on earlier versions of the software and so you should be able to find the same options on whatever version you have if you hunt for them. There are other presentation software programs out there, but Powerpoint is the one I'm most familiar with and probably the most popular. I'm not going to use the little copyright symbols next to every instance of the word Powerpoint, because that would be annoying, but PowerPoint is the copyright of Microsoft Corporation and that should be understood throughout this post. I believe I am operating under fair use here, but I will take down the page if I get any official looking cease and desist letter. 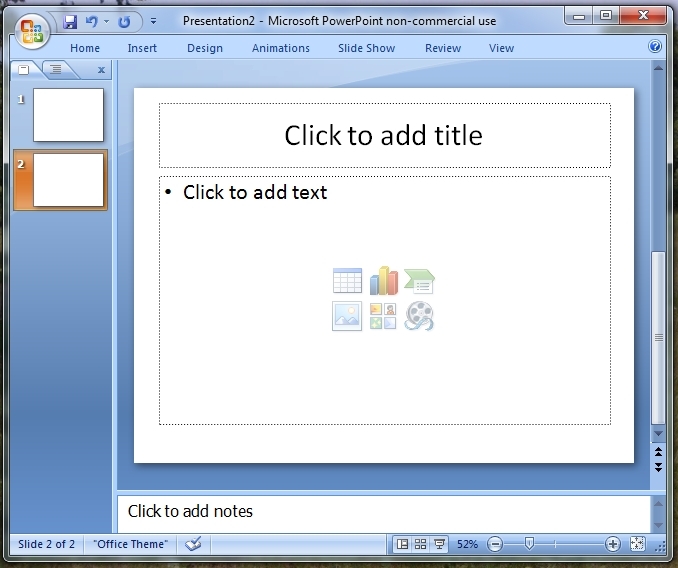 On most modern PC and mac computers, there is a program called PowerPoint. If you’ve taken a class anywhere in the last decade, you’re probably encountered it . You might even hate it. It certainly has its critics, but you don’t need to worry about any of that. Basically PowerPoint makes slide shows. The reason why it’s useful is that it combines word processing, image editing, and even a little movie making into one lovable Frankenstein program. You can type in words or copy pictures into the slide and view your finished product by clicking the slideshow symbol (on the bottom to the left of the 52% in the picture). Once you’ve made one slide you can create new ones until you have an entire sequence of slides that you can use for a presentation at a meeting, or for your own benefit. Even if all you do is type text into the various slides, Powerpoint is helpful in a meeting to keep you on track, or as a way of outlining a narrative for a story or talk. You might already see one way to use PowerPoint to study. In the first slide, you might type a word, say, and then in the second slide you can have both the word and the definition. Instant flash card! And its not as difficult to keep from cheating. You could also use a word that describes a diagram that you have to learn to draw, and in the next slide you could have the diagram, which lets you check yourself against somethings that’s probably a little larger, more accurate, and more readable than what you can hurriedly scratch out on an index card. If you had to memorize the names and locations of all those organs, it would take a whole stack of index cards . But there’s a trick you can do in Powerpoint that makes studying this stuff a hundred times easier. First copy-paste or insert the picture into the Powerpoint file (right-click on picture->copy->right click on powerpoint-> paste or Insert->picture symbol-> browse-> enter filename) Once you do this you can move the picture around if you click on the center of the picture and drag, and you can resize the picture by clicking on one of the dots in the corner and dragging out or in. There should be an area that says “Shapes.” If you click on this button, you’ll get a selection of various shapes you can use. It’s easiest just to use rectangles so just click on the rectangle shape, which should be near the top of the popup menu. Once you click on the rectangle you can click anywhere on the slide and drag out to create a box however big you want it, and move it over one of the terms you need to know. Okay. Now you can’t see the word. That doesn’t do you much good on its own. You want to be able to remove the block on command. Go to “Animations” and click on “custom animation.” This will create a panel on the right side of the screen which will let you assign animations to the rectangle. You want to have the box disappear when you left click. To do this, in the custom animation pane, click on “Add Effect,” then select “exit.” You are given a list of options, but it doesn’t really matter which one you select, they will all cause the box to disappear when you left-click your mouse or hit a cursor key in slide show mode. 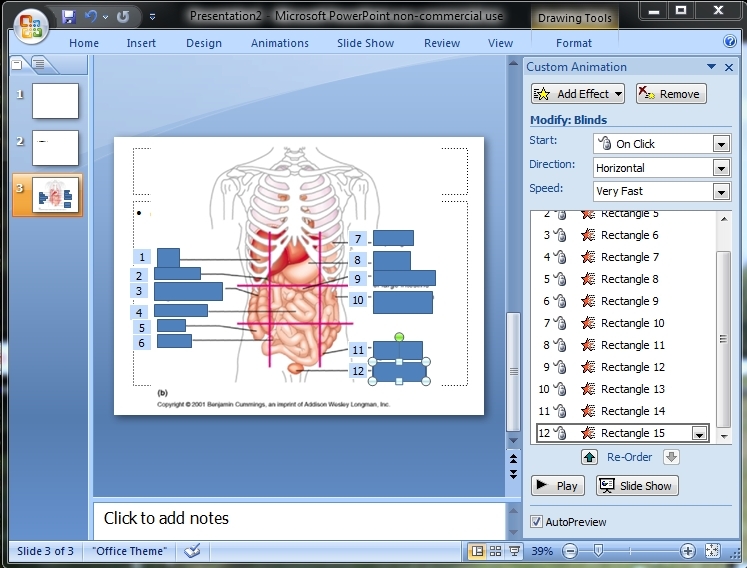 Once you select one of the options, powerpoint will show you what the animation will look like. and then an entry will show up in the box toward the center of the pane. This box lists all the different things that have animations in your slide, as well as some options for the animations. You don’t have to worry about those now, but you can play with them to create different effects. What we’ve done so far is create a box that goes away when you click a button. You can go into slide show mode and confirm that this works. But we could do this by making a new slide without a box in it. So what’s the point? Well, remember copying and pasting? You can do that to the rectangle you’ve just made, duplicating it as many times as you want. And each time you duplicate it, you duplicate the animation as well. 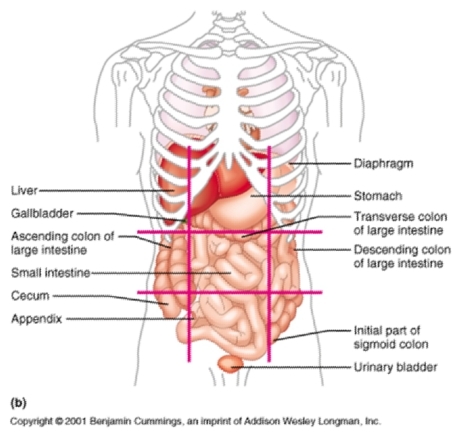 Now, when you go into slide show mode, each time you click your mouse, a block will disappear, allowing you to study not only the names of the organs, but also their locations. This is incredibly useful for subjects like anatomy and physiology, but it works for anything large and complicated that you need to learn all the elements to. And of course you can use simpler methods for the simpler things you need to know, making powerpoint an excellent tool for review.